I have previously reviewed on this blog “One Hour Wargames: Practical Tabletop Battles for those with Limited Time and Space” by Neil Thomas. Last week I was at last able put some of the rules and a couple of scenarios from the book to the test with my friend John of Jacksarge’s Wargames Ramblings. Our field of battle was a round dining table just under four feet in diameter and covered with a green blanket and terrain features. We played two games; one late morning and one in the early afternoon. I photographed both games, although some the pictures are a bit blurry they do show the general course of the battles quite well. 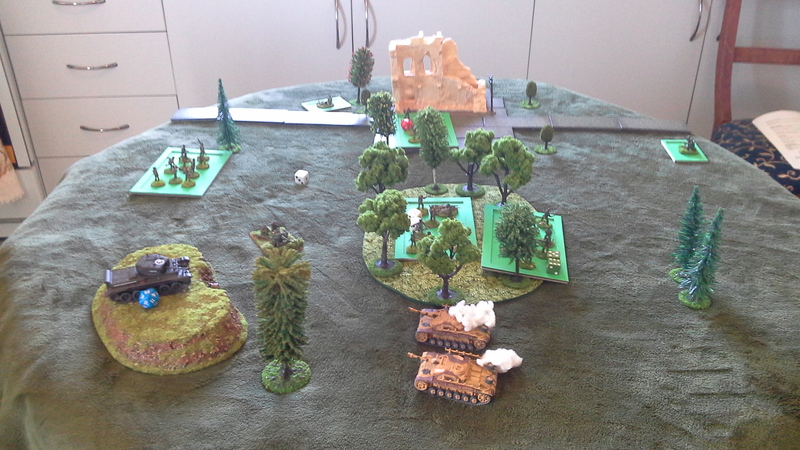 Our first action of the day was fought using the World War 2 rules and scenario 14 from “One Hour Wargames”. 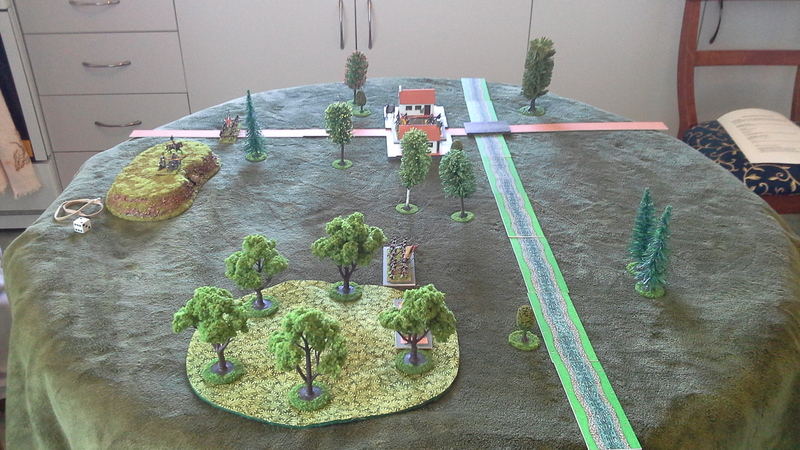 The premise of the scenario is the static defence of two terrain features; one a hill and the other a town. The defenders had to remain in control of both for fifteen turns, with two units always within 12” of each of the features. Both sides consisted of six units of 1/72 tanks, support weapons and infantry. The resulting game was an all-out firefight that ended by about turn 8. John had the British force while I had the Germans. At the start of the game the British occupied the ruined town with one infantry unit, with support provided by the nearby mortar and AT gun. One infantry squad held the woods in the centre of the table, while another was held in reserve near the hill at the back of the battlefield. A Cromwell Mk IV held the hill. 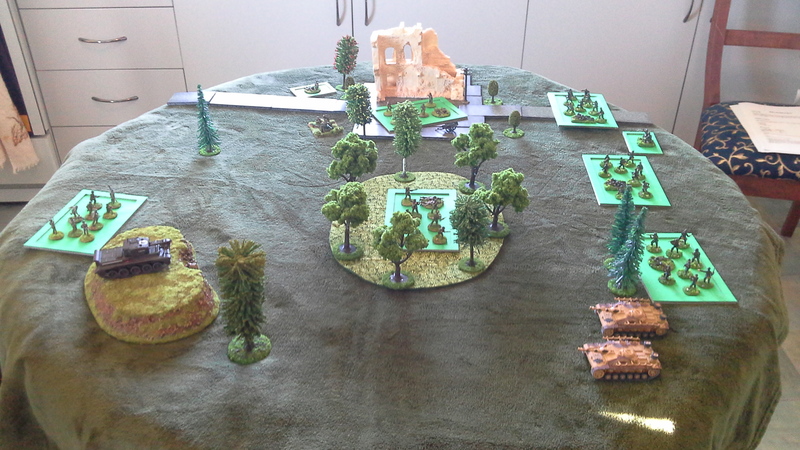 Turn one after the Germans have deployed. First turn of the WW2 game saw the Germans deploy onto the table and immediately come under heavy fire from the already deployed British. Turn two saw a general German advance with one infantry unit attacking the British occupied town, while the other two attacked the defended woods. 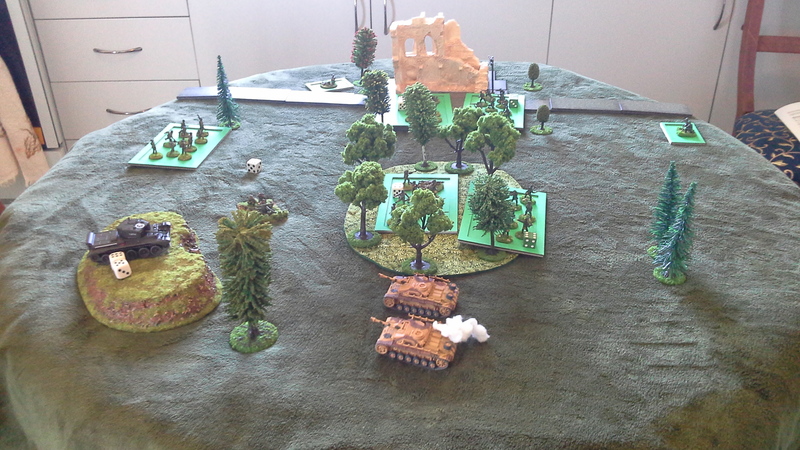 The two stugs moved forward to engage the lone Cromwell. 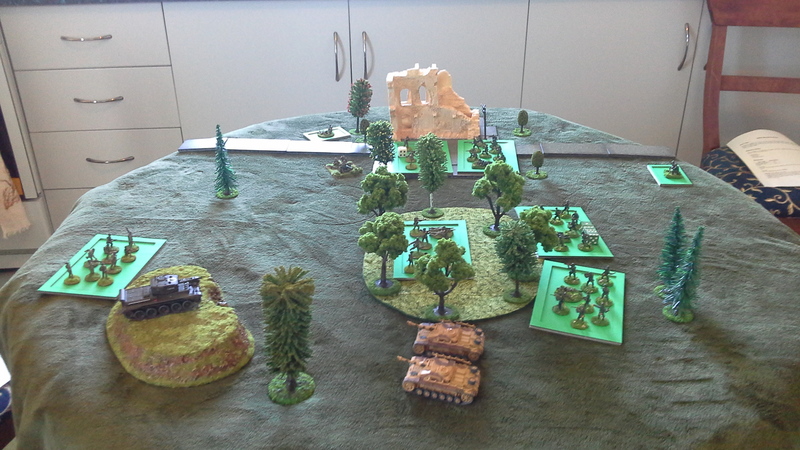 Turn two and the Germans attack. By turn four the British had eliminated one of the attacking German squads. One German unit had entered the ruined town and attacked the British unit entrenched there. A second unit entered the wooded area and took on the British there. The two German Stugs had moved forward and engaged the Cromwell on the hill top doing significant damage but failing to destroy it. 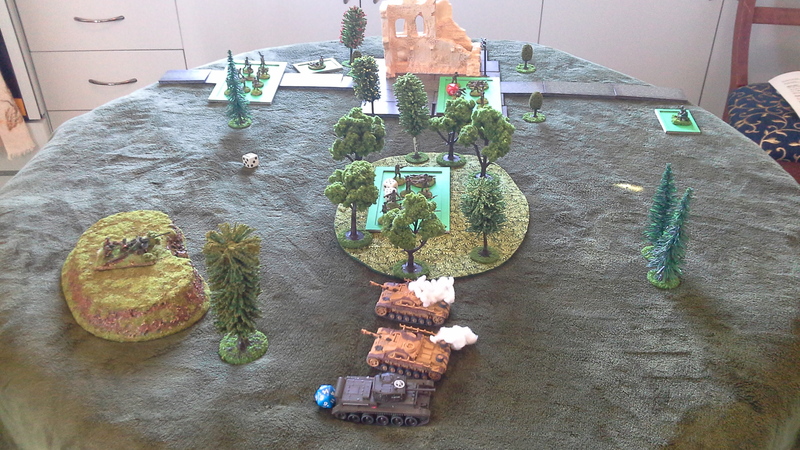 One Stug was destroyed by return fire from the Cromwell and the rapidly redeployed AT gun. Turn four and the German attack begins to falter. By turn six the second Stug had fallen prey to the combined fire power of the Cromwell and AT gun and the German squad fighting in the town had been destroyed. Turn eight saw the last German infantry squad eliminated and a British victory. Turn six and the German attack is stopped. Turn eight and British victory! After a quick change of scenery we played the second game using the horse and musket rules found in the book. 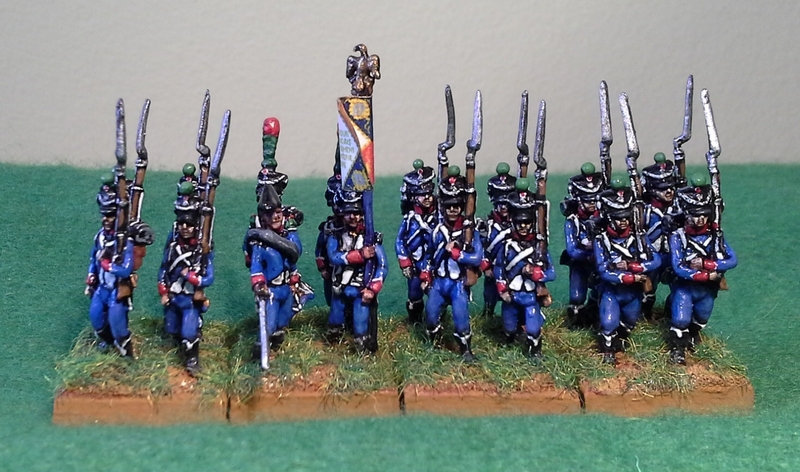 We used the army generator also found in the book to create both forces of six units each of 15mm Napoleonics. 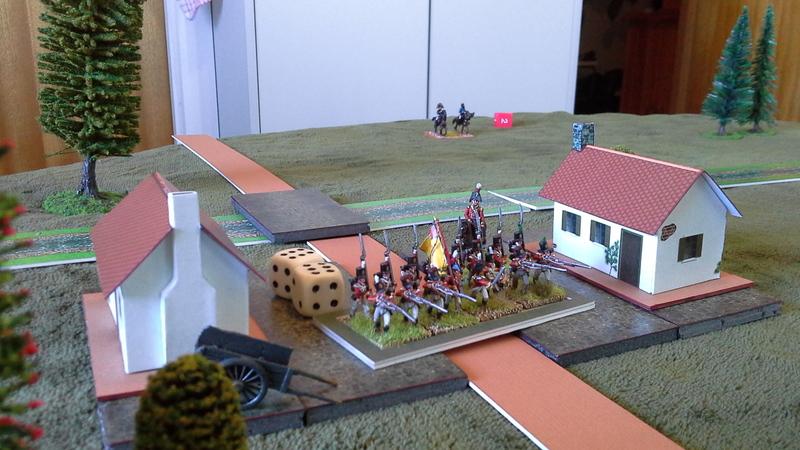 This game, scenario 9, was a double delaying action based on the Battle of Wavre. John’s British had the difficult task of remaining in control of the town while withdrawing 3 units. A unit had to be withdrawn of the table by the 4th, 8th and 12th turns respectively. The French were tasked with delaying the withdrawal or seizing the town. This game was hard fought and ran almost the full 15 turns, with final victory for the British resting on the success of one last volley. 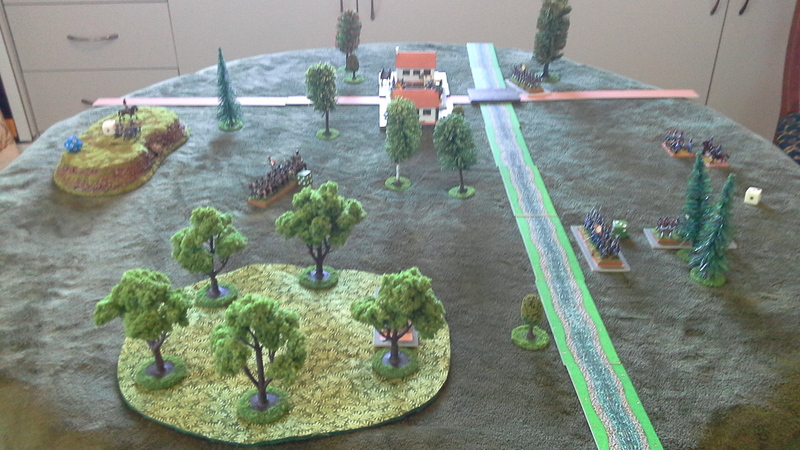 The British began the game already deployed with one unit of skirmishers and one unit of infantry in the town. A second unit of skirmishers occupied the woods further up the river, overlooking a ford. Support was provided by another infantry unit near the ford. A gun battery was placed on the hill to the rear of the British deployment zone and a further infantry unit straddled the road to the rear of the town. During turn one the French arrived on the battlefield and immediately advanced three units of infantry towards the town. An artillery battery held the French centre while a unit of French cavalry and a unit of infantry advanced towards the ford. The British responded by opening fire with the artillery and the units deployed in the town and further up the river. Turn three saw the French flanking force reach the ford, putting the cavalry within striking distance of the British infantry situated there. The British infantry unit reacted by forming square. The British defending the town kept up the exchange of volleys with French infantry endeavouring to assault the town. Turn three and the French reach the ford. The fourth turn saw one of the French units involved in the attempt to take the town destroyed. 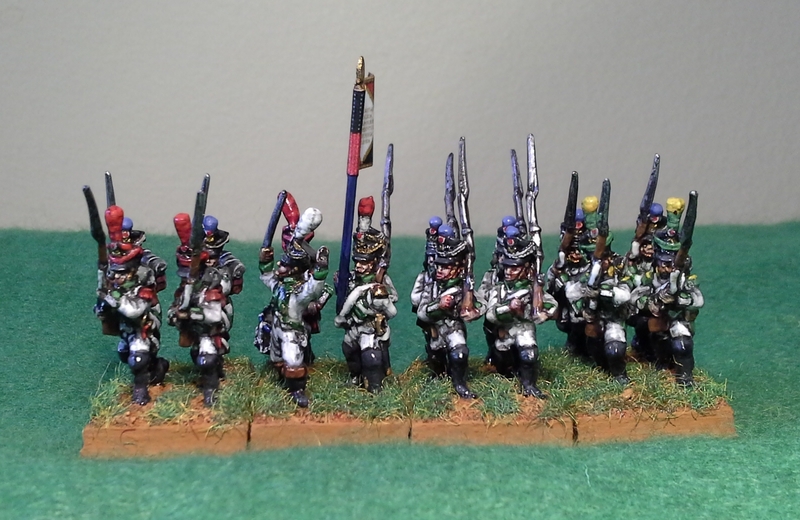 One of the other remaining French infantry units was sent to support the more successful advance of the flanking force. The British infantry in square was also eliminated by the fire from the French flanking force and the artillery battery. 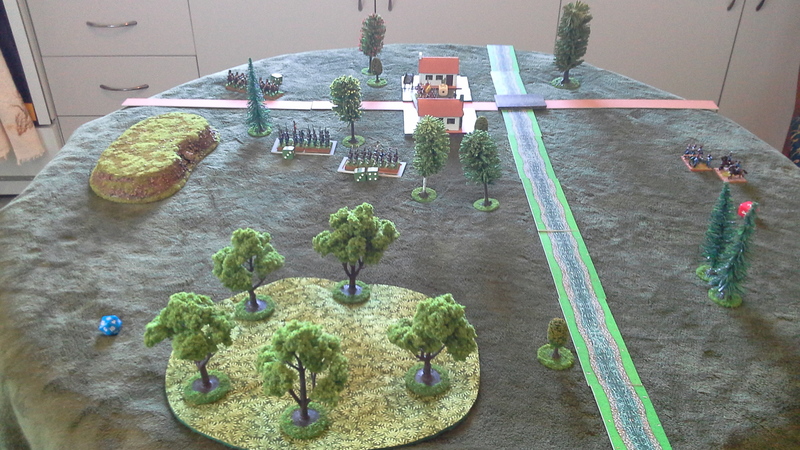 The British infantry on the road withdrew off the table in accordance with the scenario requirements. The French cavalry, after crossing the ford, kept up their advance towards the British artillery on the hill. 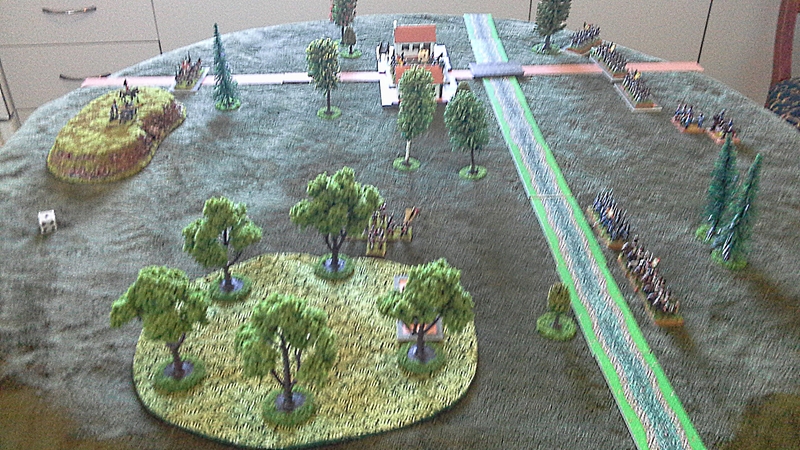 During turn five the British skirmishers in the wood retired towards the hill at their rear. The French cavalry charged the British gun battery, while the rest of the flanking force followed on. The town remained hotly contested. Over the next couple of turns the French cavalry repeatedly charged the British artillery and were repulsed. The British skirmishers continued their withdrawal to the hill. Turn five and the French cavalry charge! The British battery withdrew off the table during turn seven and was replaced on the hill top by the skirmishers. These were also able to beat off a further attack by the French cavalry before continuing their own withdrawal off the table. The British skirmishers in the town succumbed to French artillery fire, leaving only one British infantry unit holding on. Turn seven and the French flanking force breaks through. 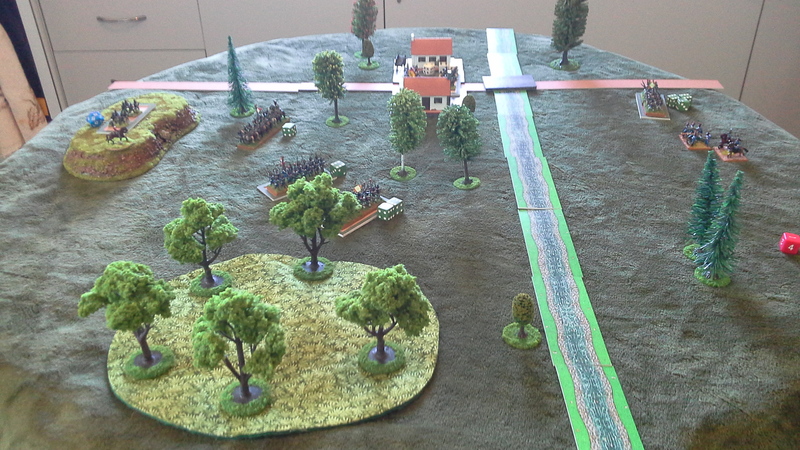 The French infantry unit attacking the town from across the river was eliminated by turn eight. With turn nine the French cavalry left the table in pursuit of the escaped British, while the remaining French flanking forces and the artillery turned their attention to capturing the town. Despite being out numbered the British stoutly defended the town and inflicted punishing casualties on the attacking French during turns ten and eleven. The French artillery limbered up during turn ten and forded the river. Turn nine the French attack the town. Turn twelve saw the intense fight for the town continue with one of the remaining French infantry units being eliminated. The limbered French artillery kept up their advance. By turn thirteen the last British unit was only three points away from its break point of fifteen. However they managed to survive the French fusillade and in return delivered a devastating volley that destroyed the last French infantry unit. So with the French no longer able to seize the town, the British were victorious. Turn thirteen and the British die hards are victorious! My Further thoughts on “One Hour Wargames: Practical Tabletop Battles for those with Limited Time and Space” (see my earlier review). “One Hour Wargames” proved great fun. The rules, although simple and relatively abstract, do manage to convey some sense of playing a particular period while delivering a fast paced game. The scenarios provide some depth to the games and present real challenges to the players. “One Hour Wargames” are a very practical solution for those wanting to play an engaging wargame to a conclusion, while having a good laugh. “One Hour Wargames can also be a useful “toolbox” for those wanting to produce more detailed but still (hopefully) fast play variant rules such as those currently to be found on the Ancient & Medieval Wargaming Yahoo Group which is the discussion group for all of Neil Thomas’s rules and books. 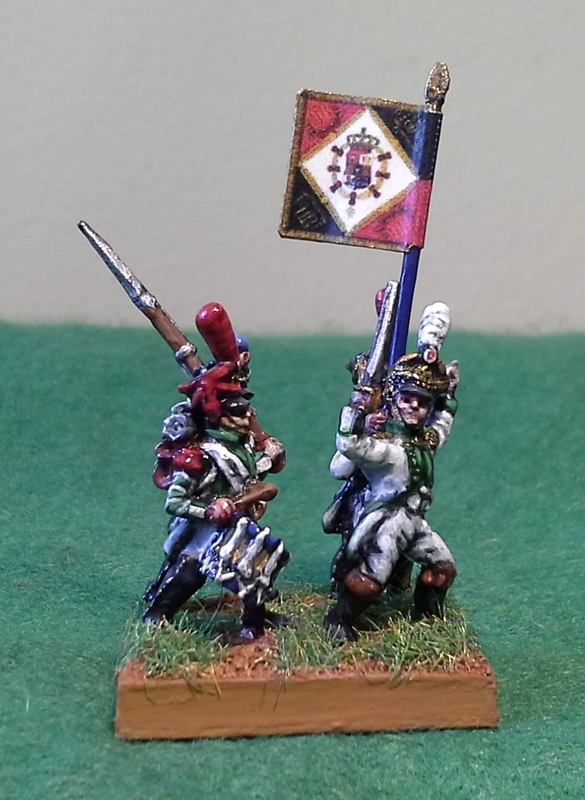 Some photos of napoleonic miniatures that I have recently completed painting or refurbishing and that have received new flags and basing (Flagged and Flocked). Most of the miniatures are second-hand and veterans of other armies but have now found a home in mine. All of the figures have had either some retouching or total repainting before being varnished and rebased. However a few of the miniatures are brand new and have of course been painted from scratch. These were to fill out otherwise incomplete units. I take great pleasure in buying old and second hand miniatures and giving them a new lease of wargaming life. They represent not only the armies of their period of history but also part of the history of wargaming. The first photos are of brigaded French line grenadiers in bearskins. The fanion should not have an eagle but I am loath to remove figures that already possess one. So I will pretend that their colonel had deep pockets and provided them with a non-regulation one. The next images are of Westphalian Guard Jagers, these received very little retouching before being revarnished and based. 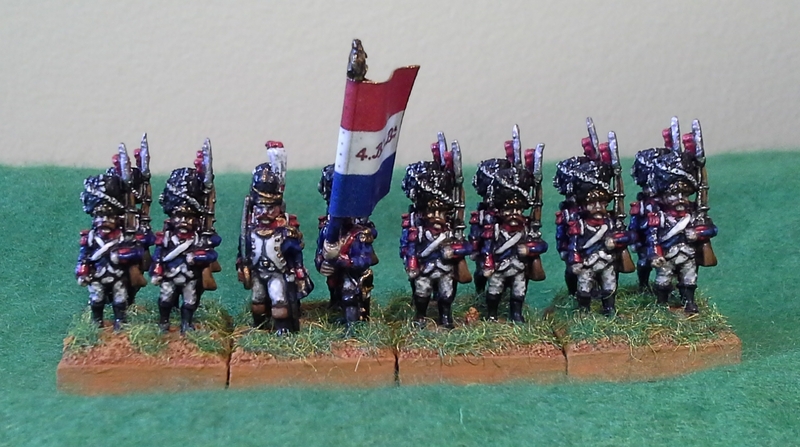 The third group of photos are of the completed Joseph Napoleon Regiment that I have previously shown on this blog as a work in progress. The miniatures are total repaints and the flag pole is a replacement made of brass wire. The original eagle came broken and I used it to provide one for some dragoons. 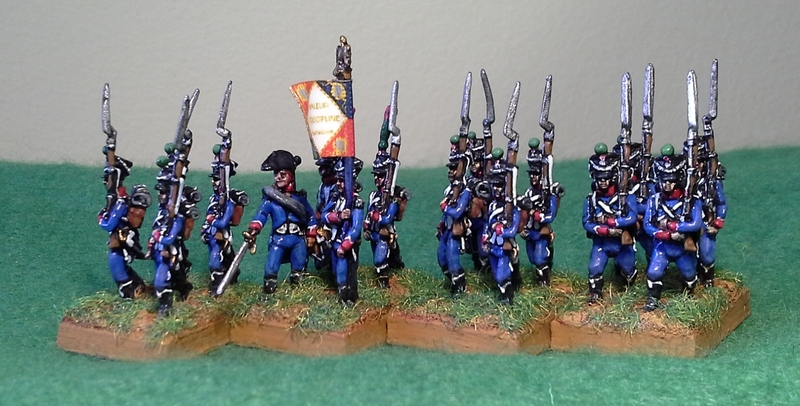 The fourth set of images is of some French light infantry. 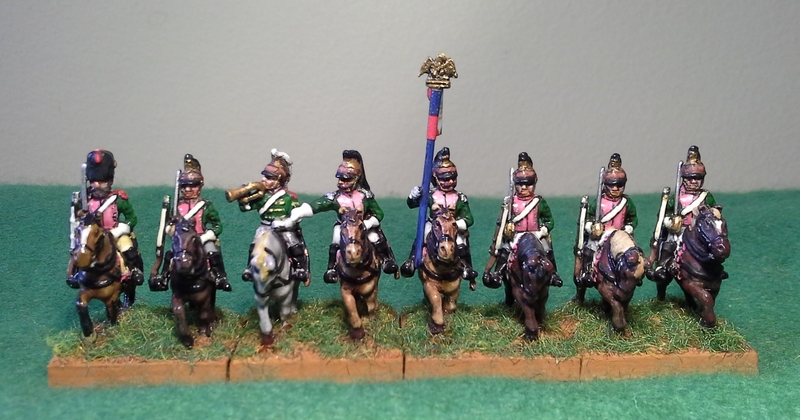 The fifth and final lot of photos is of French dragoons that I bought from Italy off Ebay. The eagle is the replacement made from brass wire topped by the broken eagle from the figures that became the Joseph Napoleon Regiment. I was fortunate to recently receive a voucher for a second hand bookstore that gave me the opportunity to add to my library of books on military history for a very small sum indeed. 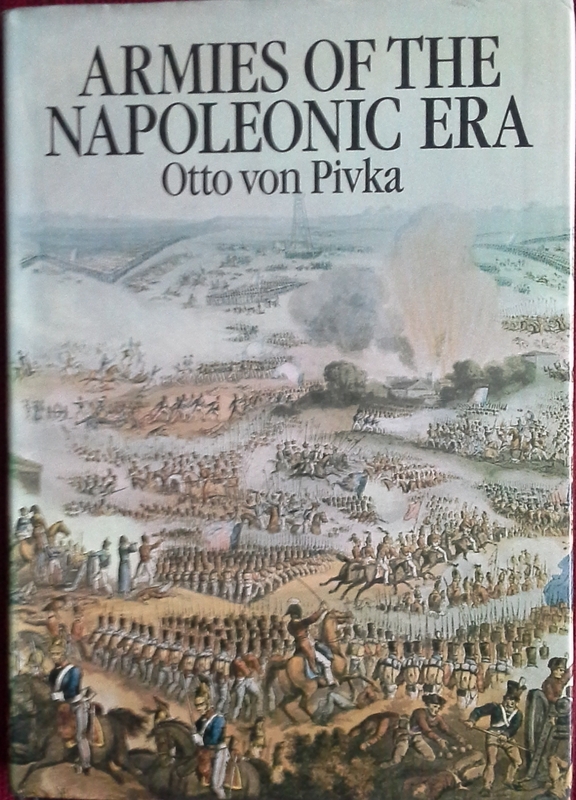 My purchase included “Armies of the Napoleonic Era” by Otto von Pivka (the nom de plume of well-known author Digby Smith) and “Weapons & Equipment of the Napoleonic Wars” by Philip Haythornthwaite. 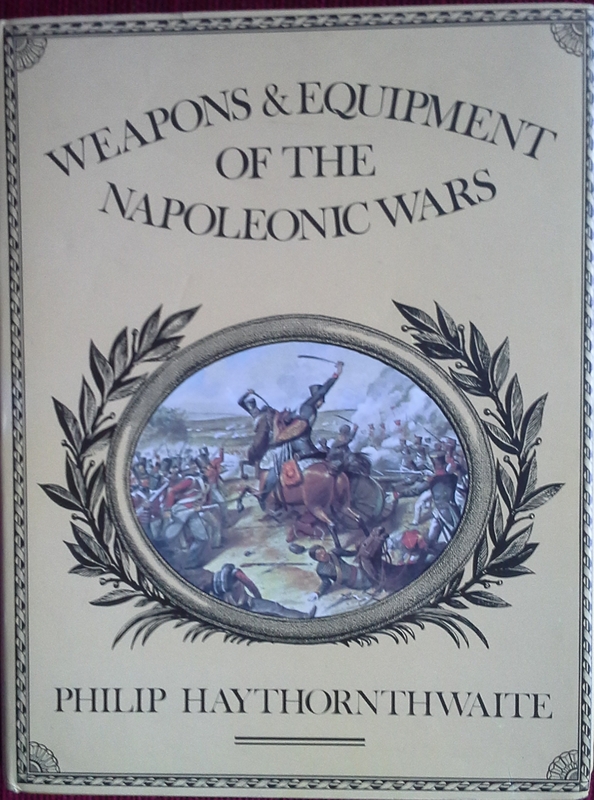 Despite their age, both of these books provide an absolute mine of information regarding the weapons, equipment and tactics of the various combatants of the Napoleonic Wars. 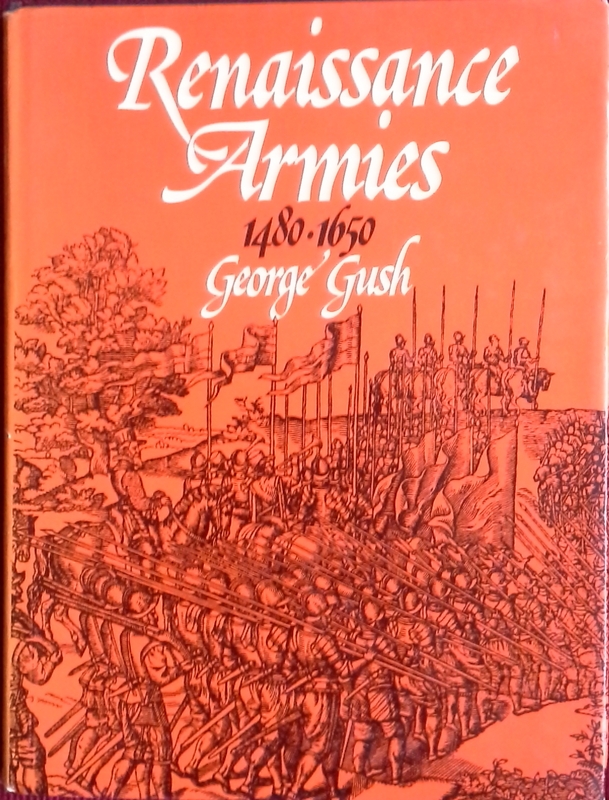 My other second hand purchase was a copy of “Renaissance Armies 1480-1650” by George Gush. Although published in 1975 it is also a really useful book that, unsurprisingly, outlines the tactics, dress and equipment of Renaissance armies.